Christine Chung is a Senior Advisor to the Committee for Human Rights in North Korea and the former Political Advisor to the Commission of Inquiry on Human Rights in the Democratic People's Republic of Korea. As a human rights officer for the Office of the United Nations High Commissioner for Human Rights, she managed the Office's technical cooperation program with China, supported the Special Rapporteur on the situation of human rights in Myanmar, and served desk functions for Northeast and Southeast Asia. Before joining the UN, Ms. Chung established and headed the China field office for the National Democratic Institute for International Affairs. She is currently advising the Leiden Asia Centre on its investigation of forced labor practices involving North Koreans in the European Union. On Monday, Marzuki Darusman, the current Special Rapporteur on the Situation of Human Rights in the Democratic People’s Republic of Korea (DPRK), participated in his final interactive dialogue with the Human Rights Council in Geneva. 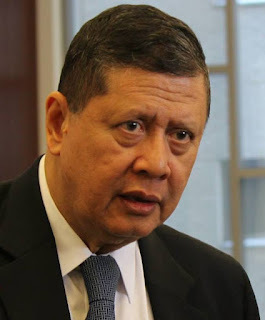 Approaching the limit of two terms, the former Indonesian Attorney General looked back on achievements during his incumbency of the mandate in a 10-minute opening statement. At the start of his first term six years ago, he noted, there was skepticism that the international community could go any further than passing annual resolutions on the human rights situation in North Korea. However, the previous mandate-holder, Thai law professor Vitit Muntarbhorn, had suggested at the end of his term that there was a need for a commission of inquiry for a deeper investigation into the subject. While it took four more years for its establishment through the consensus of the Human Rights Council, the Commission of Inquiry on Human Rights in the DPRK (COI) in 2014 delivered definitive findings to focus “unprecedented concern” on the dire situation of human rights. Mr. Darusman argued that the COI, by establishing that crimes against humanity had taken place and were currently being committed, had helped to “re-profile” North Korea within the United Nations system raising its human rights problems to the highest political level and aligning them with concerns about peace and security. The Special Rapporteur emphasized that the human rights situation in North Korea has not changed at all in the past two years: political prison camps still operate; authorities still carry out torture with impunity; religious believers are still subject to persecution; food insecurity remains rife despite the emergence of markets; slave-like organizing of labor continues while workers are sent abroad to have their earnings confiscated by the state; and victims of kidnapping have not yet been accounted for. Alluding to recent North Korean ballistic and nuclear provocations, he characterized the country’s external aggression as the flip side of the same coin that expresses itself internally in brutal suppression of human rights. He also noted that workers sent abroad to earn foreign exchange for the regime were subject to “severe labor conditions.” While there has been increasing talk of the need for a peace treaty to resolve the situation on the peninsula, the Special Rapporteur emphasized that accountability must be part of any discussion on unification. The question is not whether there should be accountability, he said, but when and how this will be done. And it is both a Korean and international challenge. Given North Korea’s highly hierarchical structure, the principle of command and superior responsibility under international criminal law points to the individual culpability of Supreme Leader Kim Jong-un. The Special Rapporteur explicitly named the North Korean leader twice in this context. Mr. Darusman said Kim Jong-un should be tried in a court of law while recalling that the COI had made the recommendation that the Security Council refer the North Korean situation to the International Criminal Court (ICC). He also noted the possibility for universal jurisdiction whereby a third country could undertake judicial proceedings regardless of the nationality of the perpetrators or victims or whether the alleged crimes occurred within its territory. The Special Rapporteur concluded his statement by repeating his recommendation that a three-member group of experts be established to investigate plausible measures to ensure accountability in North Korea. Following procedure, Vice-President of the Human Rights Council H.E. Mr. Ramón Alberto Morales Quijano (from the Republic of Panama), who was chairing the session, gave the floor to the delegation of the concerned state. As the North Korean delegation was not present, he proceeded to call on the representatives of member states in order of their inscription—activated electronically for one minute at the start of the session. The first to speak was Deputy Head of the European Union (EU) Delegation to the UN in Geneva Dominic Porter who, noting that the COI had presented a major turning point, supported Security Council referral of the North Korean human rights situation to the ICC, encouraged the DPRK to engage with the Special Rapporteur and the field-based structure of the Office of the High Commissioner for Human Rights (OHCHR) in Seoul, and explained that the DPRK resolution would call for extending the mandate of the Special Rapporteur. Other EU states aligned themselves with the EU statement, including the Republic of Estonia, Ireland, the Federal Republic of Germany, the Portuguese Republic, the Czech Republic, the United Kingdom, the Slovak Republic, the Republic of Lithuania, the Kingdom of Spain, and the French Republic. The Russian Federation condemned the Special Rapporteur in a particularly harsh statement. Russian representative Dmitry Vorobyev said the usual thanks to the mandate holder are not warranted as he had politicized the process in a non-professional way instead of seeking a normal respectful dialogue. He accused the Special Rapporteur of flagrantly violating the code of conduct for Special Procedures mandate holders by openly calling for regime change. Vorobyev questioned the Special Rapporteur’s suitability for holding the post alleging that he had undermined the whole system. Nevertheless, the representative conceded that Pyongyang has problems with its human rights, but “whipping up confrontation” would not help. In contrast, the United States of America, represented by Special Envoy for North Korean Human Rights Issues Ambassador Robert King, commended the Special Rapporteur’s outstanding accomplishments, expressed disappointment over North Korea’s lack of cooperation with the Special Rapporteur, and noted that the United States is committed to working closely with the international community on improving human rights in North Korea. Other supportive states included the Commonwealth of Australia, the Kingdom of Norway, the Republic of Botswana, New Zealand, and the Republic of Albania. Given its own history with country-specific mandates, the Republic of Cuba (Cuba) objected to what it described as the “selective and politically motivated” mandate of the Special Rapporteur. Cuba’s representative noted there was no genuine intent to contribute to dialogue and disparaged the establishment of new monitoring mechanisms outside the work of the Human Rights Council. Highlighting the punishment and sanctions imposed on North Korea which deny it the right to peace and development, Cuba’s representative said her country would never support actions to bring about regime change. She said that the best support could be provided through mechanisms of cooperation such as the Universal Periodic Review (UPR) that provide a venue for non-politicized debate. The Islamic Republic of Iran’s representative echoed Cuba’s position calling for dialogue and cooperation while noting that human rights should not be used for political ends and that unilateral coercive measures have negative effects on the civilian population. The Republic of Sudan’s representative emphasized that cooperation with the country was essential, recalling that the DPRK’s second UPR was encouraging as the country had accepted a number of recommendations. The Republic of Belarus’s representative expressed doubts about the establishment of another group of experts above other mechanisms without the consent of the DPRK. The Lao People's Democratic Republic’s representative stated his firm belief in the UPR as the most constructive dialogue forum for any country and took note of the DPRK’s participation in the UPR and high-level segments. The Syrian Arab Republic’s representative claimed that dual standards are in play and that the selective approach to North Korea undermines the Human Rights Council. He said that calling for the dismantling of the power structure violates the principles of the UN and that those who wish to see a change in government are dictating the extension of the mandate. The Bolivarian Republic of Venezuela called for reconsideration of country-specific mandates. Of the three states most directly impacted by North Korea, Japan, represented by Ambassador Extraordinary and Plenipotentiary Permanent Representative to the International Organizations in Geneva Junichi Ihara, noting the escalation of provocative actions by North Korea, said that Security Council Resolution 2270 reflects strong international concerns about human rights and the humanitarian situation in the DPRK. He expressed support for the group of three experts idea proposed by the Special Rapporteur and noted its inclusion in the draft resolution co-sponsored by Japan and the EU. The People’s Republic of China’s representative Wang Yi reiterated that equality and mutual respect should be the grounds for engagement with the DPRK. She said that the root cause of the problems was the lack of political trust, a lingering effect of the Cold War, which necessitated negotiating a pathway away from the armistice through dialogue and cooperation. Furthermore, she regretted what she called “inaccuracies” about China in the Special Rapporteur’s report noting that China’s goal has been denuclearization of the peninsula and safeguarding its legitimate security concerns. Representative Wang Yi repeated the Chinese official position that North Koreans in China are not refugees but illegal aliens. She further stated that China has always adhered to Chinese, international, and refugee laws. The Republic of Korea (ROK) expressed full support for the Special Rapporteur and the OHCHR field office in Seoul. ROK Ambassador for Human Rights Jung-Hoon Lee regretted that the DPRK is boycotting Human Rights Council sessions and remarked that if conditions in North Korea are what the government claims, there would be no reason not to unconditionally invite the Special Rapporteur to visit. He also called on all states to respect the principle of non-refoulement. After interventions by member states, national human rights institutions and nongovernmental organizations got their turn to speak. Human Rights Watch noted the importance of pursuing justice not just for past human rights violations (or “atrocities”) but for sending a message to officials that further abuses now would subject them to prosecution in the future. UN Watch was represented by Gayoung Kim of NK Watch, who detailed ongoing human rights violations of women, including sexual harassment by agents, particularly targeting victims in their 20s. Amnesty International focused on violations of freedom of expression, tightening of border security, and an increase in surveillance. People for Successful Corean Reunification highlighted the situation of North Korean workers overseas whose earnings get confiscated, thus forcing them to engage in illegal activities to survive. Discussions on the North Korea resolution are currently going forward. According to Ambassador Ihara, Japan and the EU intend to include support for the Special Rapporteur’s recommendation for a group of experts on accountability in the draft resolution. A new human rights investigation body, coupled with the renewal of the mandate of the Special Rapporteur on the Situation of Human Rights in the DPRK, would keep up institutional pressure on Pyongyang. Side events that followed the interactive dialogue focused on forced labor by North Koreans both inside and outside the country and human rights violations against women and persons with disabilities. These two informal panels reflected increasing interest in these specific areas of concern. Certainly, North Korean women experience many additional levels of vulnerability and abuse ranging from pervasive discrimination to severe gender-based violence. In many respects, there has not been sufficient attention to the gender dimensions of the human rights situation in North Korea. It is symptomatic that trafficking of North Korean women in China, given its likely scale and scope, has not received the level of scrutiny the situation warrants. On persons with disabilities, the COI desperately sought to find one glimmer of hope in an otherwise grim portrait of human rights inside North Korea and found it in the DPRK’s signing of the Convention on the Rights of Persons with Disabilities. Nevertheless, regardless of whether Pyongyang takes the next step of ratifying the treaty, North Korea’s lack of compliance with the other four human rights treaties that it is already a state party to indicates that this may not be real progress in the intentions of North Korean authorities. After all, Pyongyang is unlikely to suddenly respect and promote the rights of persons with disabilities. Meanwhile, several organizations have started examining North Korea’s practice of dispatching labor abroad under what appears to be conditions of forced labor. This approach has the advantage of overcoming some barriers of accessibility and of dealing with states that are more serious about implementing applicable labor and human rights laws. In these and various other ways, civil society promises to continue to do its part in advocating for improving the lives of North Koreans. 25. Decides to transmit all reports of the Special Rapporteur to all relevant bodies of the United Nations and to the Secretary-General for appropriate action.